SAE Products® grease gun holders feature a simple snap action clamp for safe storage of any standard grease gun or suction gun with a barrel outside diameter of approximately 2-1/4" (57 mm). 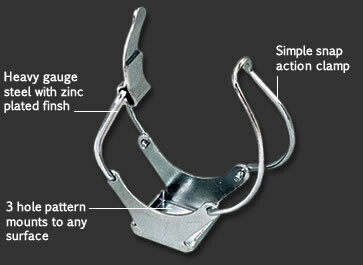 Grease gun holders are manufactured from heavy gage steel and are zinc plated for durability. Precision made in the USA with all steel construction to last a lifetime.